Our product range includes a wide range of mezzanine floors. In changing industry demands mezzanine floors are the necessity due to lack of space availability, we are engaged in offering a supreme quality range of Mezzanine structures. These mezzanines are manufactured by our experienced and most qualified experts with the utilization of quality raw material and modern machines. Freestanding mezzanines: Also known as structural, steel, or wide span mezzanines, these are commonly used in a wide variety of applications and offer great flexibility in set-up and restructuring if needed. Freestanding mezzanines and platforms are considered capital equipment and, thus, can be depreciated over a shorter period of time. Building supported mezzanines: If a building is designed to support additional loads, the structure can be used to support a mezzanine or platform. 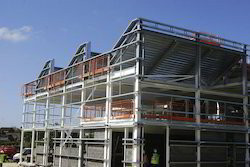 A blended system can also be developed in which a mezzanine is supported partly by the building structure and partly by columns, as long as the foundation can support the additional load. We are capable of handling building-supported mezzanines without calling in a general contractor. Rack supported mezzanines: These platforms create a mezzanine level of usable space between existing storage racks, provided that the rack system can support the additional loads. Catwalks also can be installed in these situations. Shelving supported mezzanines: Ideal for storage of smaller items alongside existing shelving. This is an economical way to make more efficient use of existing space.